If you like dark psychological twisty books where you can never be sure of what's really true or happening, than this book is for you. That's the simple sale for this book, but it is really fabulous. I didn't want to put it down but it wasn't just a book aiming to shock for the sake of surprise alone, but a book that dealt heavily with a matter of interesting thematic concepts. There's some really interesting mother/daughter stuff here and nature vs. nurture issues. But it's also just one of those stories where you get fragmented pieces, a bit at a time, and puzzle to put them together while you read. What's really going on? What's the truth behind what you're presented with? And beyond that the book is incredibly atmospheric as it takes place in present during a snowstorm on Christmas Day, and in the past in Siberia. 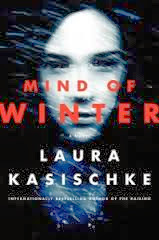 The title, Mind of Winter, isn't lying! This persistent feeling of cold and snow piling up really adds to the mounting dread you feel as you read. The book opens with Holly waking up and feeling panicked that "something followed them home from Russia." I have to admit this was a fabulous hook for me! And the story progresses from there as Holly and Eric attempt to savage their Christmas and Holly deals with an increasingly difficult relationship with her teenage daughter. I don't want to say too much else, but I could really see it as a movie! I received an ARC for review!